Hailing from Mexico City, Norman is happy to return to his Mexican roots after leaving when he was a teenager. With many years being spent in Canada, Norman learnt to appreciate wide open spaces and cold water diving, but he longed for some warmer waters (after a few winters on the West Coast you'd understand!). 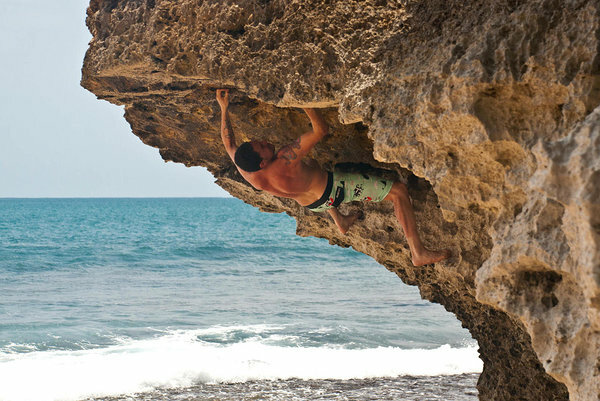 He went to work as a Dive Instructor in the Caribbean and spent time in the Bahamas, Cayman Islands and Caribbean Mexico before returning North to Canada to work as a commercial diver in the little known surf town of Tofino. He is excited to be back in Mexico and exploring the diverse waters of the Sea of Cortez. Norman has a passion for the water and loves problem solving with his 'can do', positive attitude. In his free time he enjoys surfing and his motorbike. Cat is originally from the UK, and although she had an outdoors lifestyle it was one which involved horses rather that the ocean! That is until learning to dive in Thailand and becoming hooked. 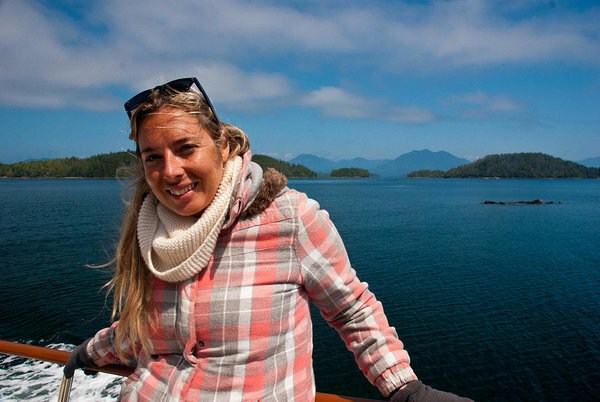 After completing her Bachelors degree in Geography and then another in education she worked for a while as a High School Geography teacher before becoming a teacher of a different kind and turned her passion for diving into a career. She has experienced the underwater realm all over the world from South east Asia and the South Pacific to Mozambique and the Caribbean. It was whilst working in the Cayman Islands that Cat met Norman and they began a new adventure together. When the opportunity arose to acquire El Duque, she started to brush up (learn from scratch!) her Spanish and the rest is history. Cat has an eye for detail and loves introducing people, both new and experienced, to the little creatures below the surface. 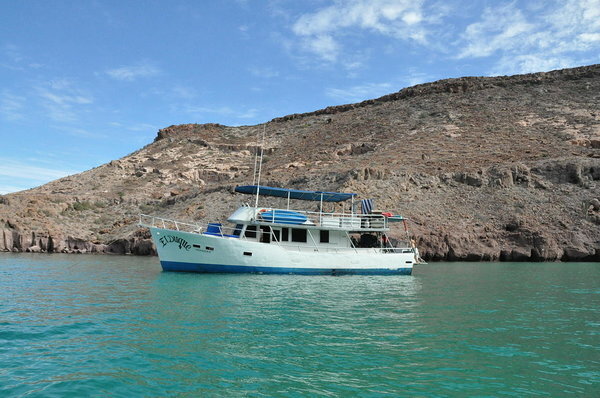 El Duque is a 53 ft converted trawler, she has 2 air conditioned cabins with bunkbeds and a bathroom in each. She is full of character, the original boat builder knew John 'The Duke' Wayne hence the name of the boat and some of her history. The bunk style accommodation will build camaraderie and lead to adventures on the high seas. There is a fully stocked galley and living area where you will enjoy a variety of home cooked meals and snacks throughout the day. The living area also provides space to relax out of the sun and play a game of cards or perhaps watch a movie on the boat TV. She also comes equipped with kayaks for you to use in your spare time. We have a spacious sun deck which is great for relaxing with a book or perhaps having a cocktail in the evening. You may even decide to bring your bedding up here to enjoy sleeping under the stars. The swim platform allows easy access in and out of the water and there is some space for your camera and electronics too. She carries all safety equipment as required under Mexican Law, including oxygen, life vests, and fire suppressants. 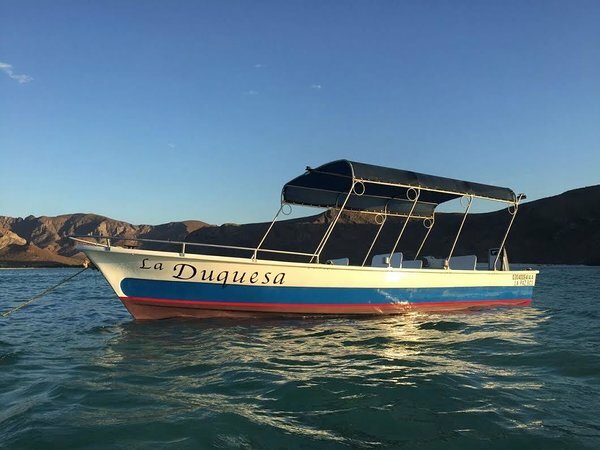 La Duquesa, a 22ft panga, she is our tender for going to the beach and running excursions such as snorkel encounters.